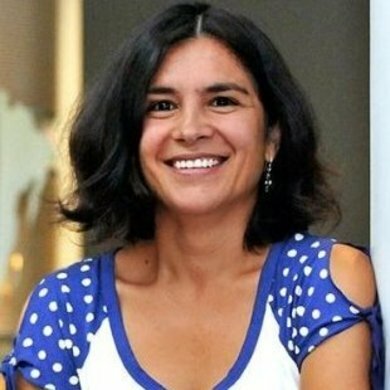 Sandrine Stervinou, Associate Professor of Business & Society at Audencia Business School in Nantes, France, and a 2017 winner of an Ideas Worth Teaching Award for her course Alternative Economic Models. It’s not just topics like the sharing economy that make this course deeply timely: reflection on the serious use of social media platforms is tightly integrated in the pedagogy of the course. As a researcher focused on comparing how economic models play out differently across national boundaries, Professor Stervinou’s perspective is of special interest to anyone who’s ever questioned if discussions of these issues are too US-centric. When many people in the US hear the term ‘economic models’, they often think, for example, capitalism vs socialism or US-style capitalism vs alternate national models. What definition of ‘economic model’ links the different topics covered in the course? The way the term “economic model” is used in the course means how a group of economic agents organizes its activities at a macro-level, but it can also refer to the way an enterprise creates and shares value, at a micro-level. For example, during the course we will deal with social economy. Students will be taught how social economy proposes a kind of intermediate way, between the State and the market, to supply products and services. Students will understand that social economy balances economic sustainability and social impact and that its weight in the total economy is not marginal -it is around 10% of the GDP, in Europe and it is in a variety of industries. At a micro level, in Europe, students will be explained that social economy covers different specific status, which comply with this balance thanks to a common capital and a democratic governance. This is a guarantee not to forget the social mission, the values and the common goal of the collective project. At the core of the course design is an assignment in which students apply these models to different companies. Can you speak a bit about what students who tend to take this course are like, and how this exercise is meant to prepare them in their longer-term goals on campus and beyond? The students following this course are first year students in the Business School, but 3rd year in Bachelor. In the French system, to enter a business school, students spend two years in preparatory classes dedicated to the preparation of entrance exam to the Grandes Ecoles (meaning high ranked French Business Schools). It is a strong selection system compared to the university system where there is almost no selection to enter in. The Grandes Ecoles will provide students a valuable diploma, which is highly prized in the job market compared to university diplomas. The trade-off is that studying in Grandes Ecoles is paid and oftentimes expensive compared to the university which is almost free. During their two years in preparatory classes, students’ learning is mainly based on theory, memorization and cramming for entrance exams. Economics courses are provided during these two years. So, this course on alternative economic models will be surprising for them in many ways. The first astonishment is the discovery of different economic fields from what they were taught, such as happiness economy, sharing economy, circular economy, social economy. Second, they realize that these economies are real and already part of their life. 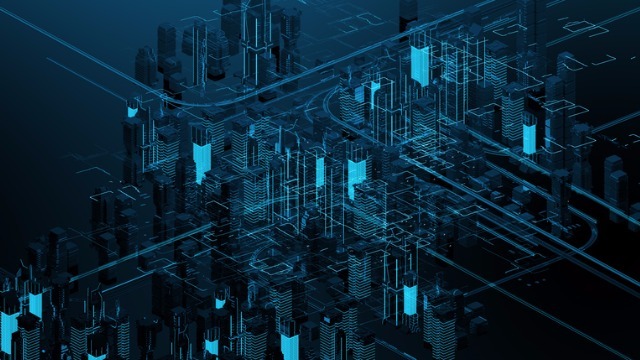 They will be given examples of businesses, of organizations working in these economies and given a grid to understand what the differences with the classical economy are. Naturally, our students are not keen to look at these other economic fields. Most of them, when they enter the school, would like to work in big multinational companies, generally in the high-tech such as Google, Apple or in the luxury industry, such as LVMH, Kering… But, we have also students who would like to create their own business. During the class, they learn that they can do business and integrate another dimension, that they can give sense to their business. So, through this course, they realise that opportunities are broader and more exciting that what they initially thought. Sometimes, they can also feel frustrated because they realize that salaries and evolution of carriers can be lower than in classical companies. They feel that it is unfair to do good without doing well. Sometimes, they do not understand why people can choose to do good and renounce to do well. During the class, we will talk about it too. There are no taboo questions and we will respect the opinion of each one. 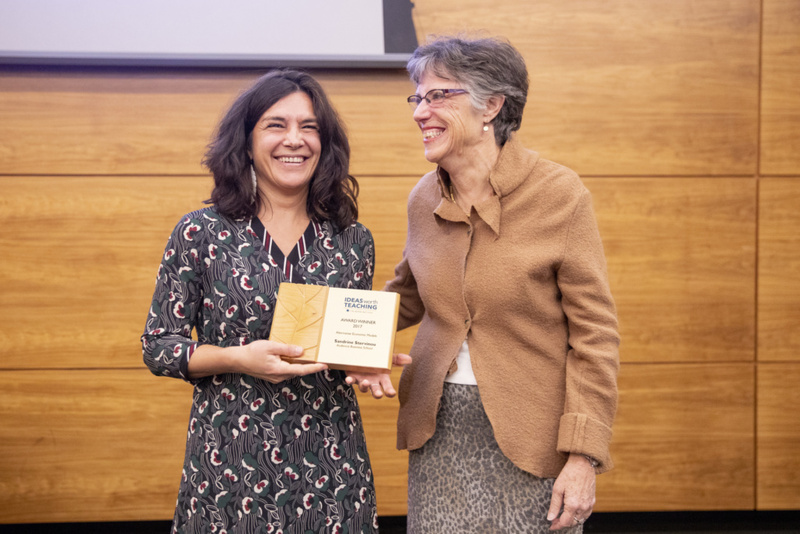 Smiling with BSP Executive Director Judy Samuelson, Professor Sandrine Stervinou accepts her Ideas Worth Teaching Award at a dinner for award recipients at the Ross School of Business in Ann Arbor, Michigan. 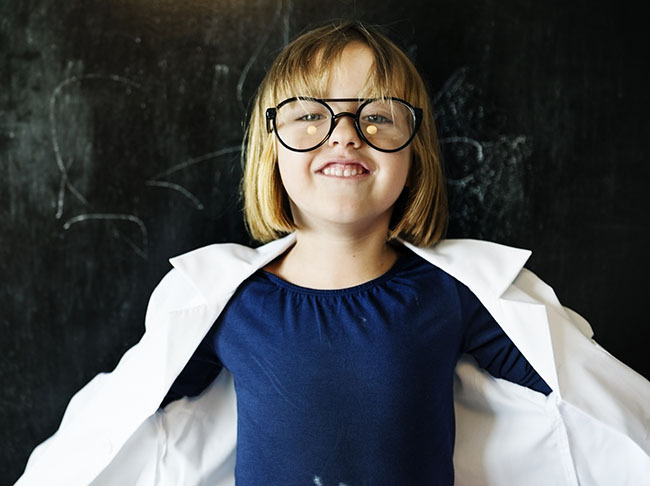 There are two other pedagogical designs in the course that feel nontraditional. First, the syllabus specifies that the presentations should include “research and both academic and non academic,” and second, that the final assignment involves producing a video, evaluated in part based on its style. What is the pedagogical goals of these elements? Our students are not accustomed to reading academic papers and designing a literature review. So, at first, when we ask them to read on a topic, they will go through newspapers, through internet pages… By doing so, they will get the general media’s opinion. Then, we ask them to research academic papers to help them understand the complexity of the topic and get a deeper vision of the topic. They will also realize that the topic they are looking at is not so easy to define. For example, many of the students’ projects are dealing with sharing economy. Students like this topic because they often use the sharing economy platforms and they think they know the subject well enough. Their first information research is often the mirror of what they think thanks to their experiences. Research articles readings will give them another view. They will for example realize that there is no agreement today on a definition of the sharing economy. Because of its absence, for the moment, we are not able to fully understand this economy and its societal stakes. The reason why the final assignment is a six-minute video is connected to their day-to-day life. They are spending lots of time at looking at videos, they even produce their own videos or producing themselves through videos on Instagram, Snapchat… But, they do not really master videos as a media tool on a serious subject. Requiring them to use this media is interesting because they have to communicate on an understandable and clear message. It asks them to design a scenario and realize a really personal and creative work. What kind of reactions (from students and faculty) enable you to know your approach is a success? To be honest, I don’t think it is a great success concerning students. This course is a bit disturbing for them in many ways: its format, its content, its assignment. At the beginning, some students consider it is not a serious course because of the different topics and the choice of the assignment. For example, for some of them, studying happiness economy as an economic subject is nonsense. At the end, I think most of them take the course seriously and do really interesting work. Some come back to me to thank me for having discovered all this part of economy. In the faculty, at the beginning, the reception was lukewarm. Some professors were skeptical but some others thanked me for having the courage to teaching these topics. Today, some of them are teaching some topics. 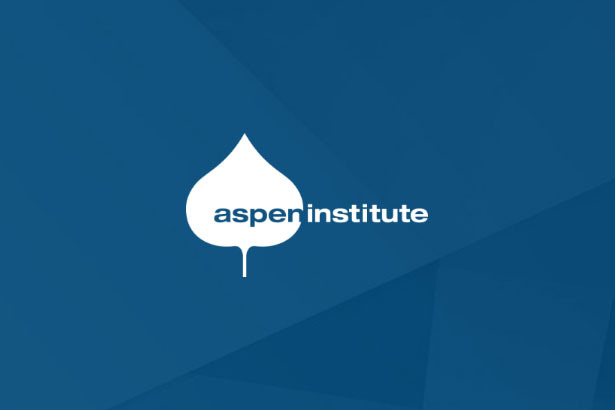 Moreover, thanks to the Aspen Institute award, I received many congratulations from my colleagues. A positive point is that this course is changing each year, following the students and the teaching staff. We abandon some topics, add new ones, we add new expectations. Now, each student group organizes a short debate on its subject in the class. Students have also to interview people working in local organizations in the field they are studying. Debates on possible futures of work in the United States rarely give lengthy consideration to alternative models elsewhere. Your research is very much focused on a comparative perspective (including case studies from France and Spain). Is there anything from the European discussions on alternative working arrangements that you think could help advance productive discussions in the US context? Being curious, confronting our visions to others help us in questioning our certainties. Looking at Spain makes me understand another social economy approach. In Europe, we are dealing with a rise of populism and xenophobia because of the increase of poverty and inequalities. 17.3 percent of the population in the EU were at risk of poverty in 2016. 19 percent of young people (from 15 to 24 years old) were unemployed. 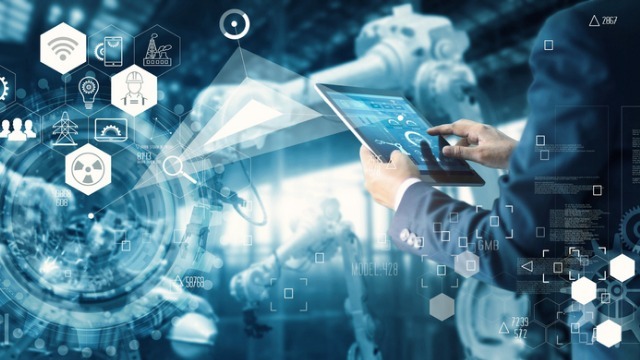 Technological progress will certainly reinforce inequalities, some jobs will disappear, high-qualified people will be sought after, low-qualified will risk staying out of the labor market. Some intellectuals are thinking about sharing work, but also giving a guaranteed income for all. It doesn’t mean that people will be paid to do nothing. Today, there are many people involved in volunteering, creative work, and family support for free. Without this involvement we consider free, a part of our society will go into pieces. Their social engagement creates lots of value for their community. A guaranteed income will be a recognition of this engagement and, also, will give people the right to choose their way of life without the fear of not being able to survive. Another question concerning work is the fear to an end of employee regime with a switch to the gig economy. Here some experts are considering that self-employed people should organize in cooperatives to recreate a “safe” space. 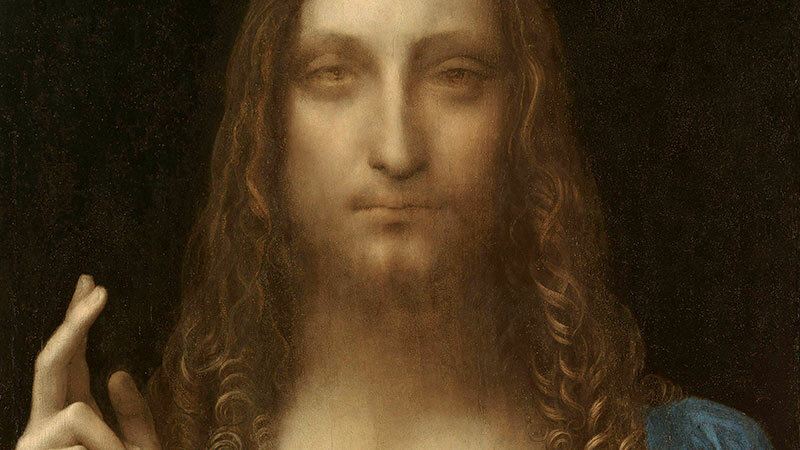 What’s Weird About Da Vinci’s Salvator Mundi?